The most intriguing development in modern cosmology is to realise that the better part of the Universe is essentially of unknown nature. This conclusion relies on two types of observations. The first one is the indirect evidence since decades of the presence of a large quantity of invisible matter, called dark matter, whose gravitational influence spans all cosmic scales, from galaxy to clusters of galaxies, and the whole Universe. The second one is the observation of an acceleration of the expansion of the Universe in the recent history, which implies the existence of a new concept, a dark energy that exerts a negative pressure opposing the gravitational attraction of matter. 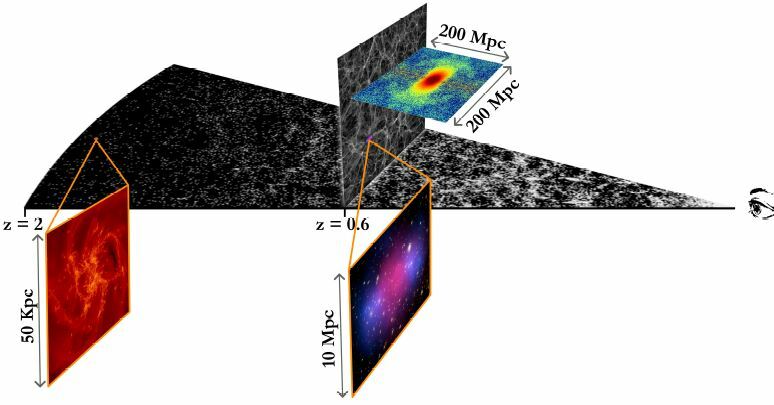 The Standard Model of Cosmology, ΛCDM, accounts for all observations thanks to only six cosmological parameters, which are now precisely known in particular thanks to the results of the Planck satellite. Within this model, the Universe is close to the critical density. Dark energy is described as a cosmological constant and represents about 70% of the energy content of the Universe ; dark matter is cold, i.e. non-relativistic, and represents another 25% ; what is left, less than 5%, is ordinary matter as we know it (gas clouds, stars, planets, etc.). Understanding the Dark Universe (the nature of dark energy and dark matter) is arguably the greatest challenge of modern physics. 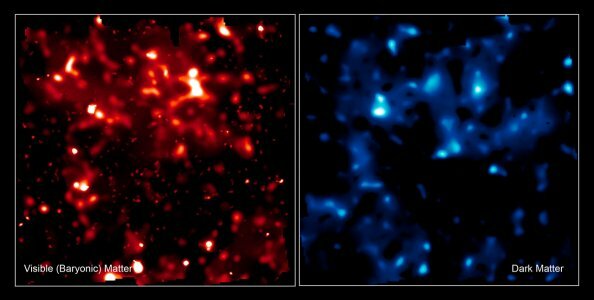 Visible matter (left) and dark matter (right) in the field of the COSMOS survey.